I am still smiling about our late morning class at “The Little Gym”! SO much fun! 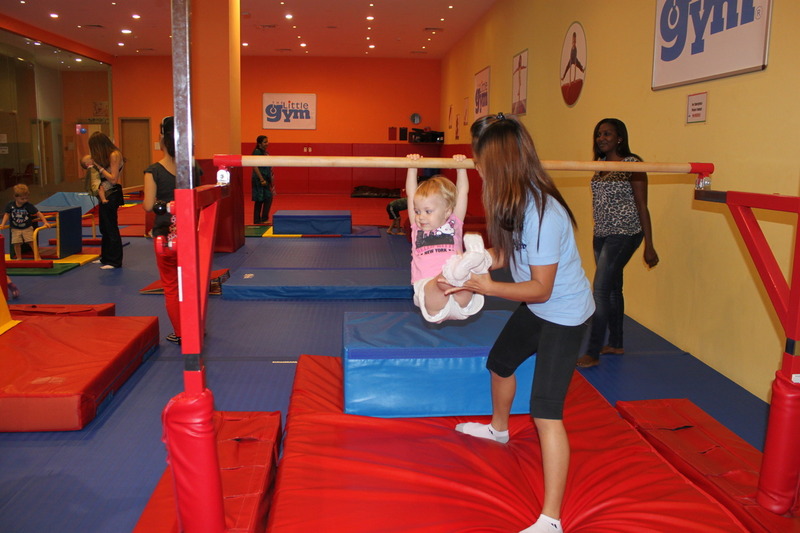 I would have to rank it as one of the best mom and tots classes I have done in Dubai to date! The staff was outstanding! Scott was the teacher for today’s class, and Cindy his assistant. 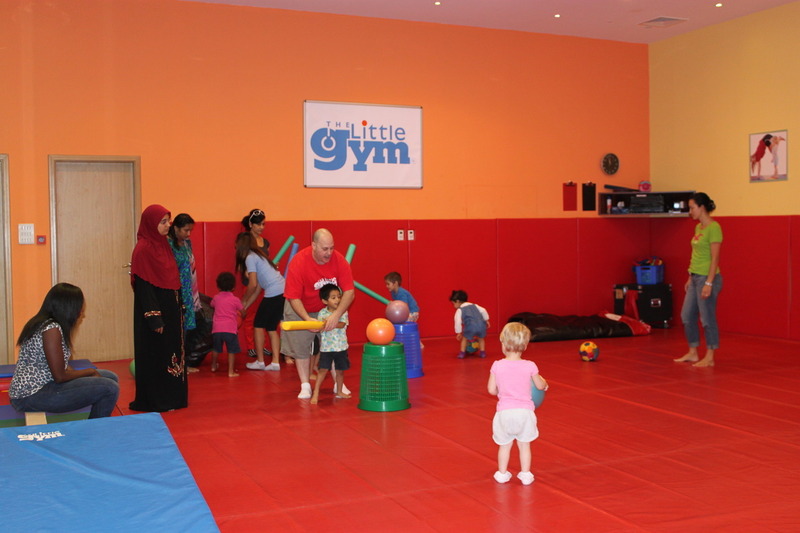 As soon as we arrived at Little Gym for our 11:15 “Super Beasts” class he kindly showed us around and explained what the venue had to offer: a beautiful party room, changing facilities for babies, washrooms, free wifi, and a refreshments area. One of the first things I noticed about the gym was how CLEAN it was! I love going to a child’s venue where I don’t feel all grossed out by germs! The class had close to ten children (age 2 ½- 3 years of age). We started off in a circle and did a few songs and activities (rattles, and a large stretch rope were used- as referenced in photos). We even learnt how to sign “backwards” in sign language! Backwards and forwards were the key words for today’s class! LO LOVED the backwards activities, she thought it was so funny! Following our circle time, we moved along to the gym aspect of the class. The kids were allowed to play with whatever they wanted! LO enjoyed the balance beam, rings, and anything she could swing off of! Scott went over some of the skills he has been teaching the tots, and gave the parents and children a chance to practice all of them. EVERY child in that room had big smiles on their faces, as they were all truly enjoying the class! How beautiful to see! After our gym activities, we finished off back in the circle. Cindy and Scott brought out some balls and pool noodles, and the kids had a go at swinging at the balls and goofing around. 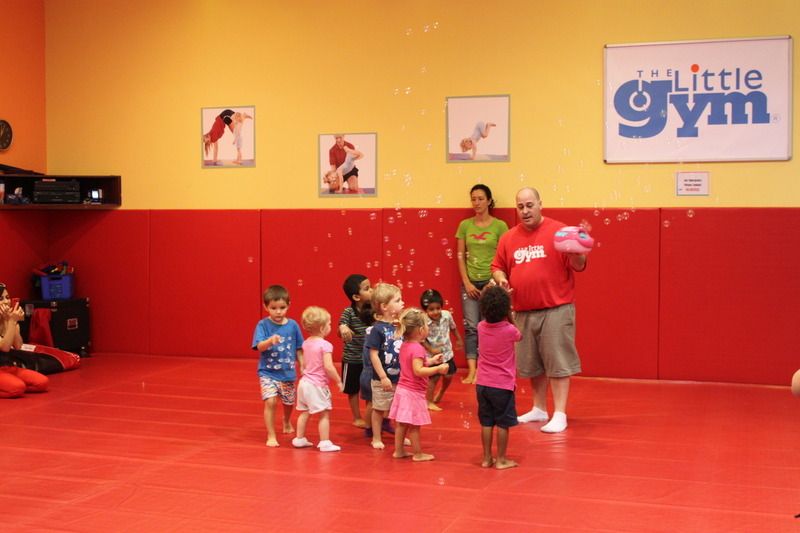 We sang some more songs, and closed off the class with BUBBLES! Which child does not love bubbles! Scott has the perfect energy to be teaching the class. The children really warmed up to him. I could go on, and on about how great Little Gym is, but you will just have to go and try it out for yourselves! I highly recommend Little Gym to all mommy’s and daddy’s! FYI…they have a complimentary introductory class for first timers! So why not get out there and give it a go! Check out The Little Gym website for more details on timings, and classes offered!